During our mini-vacation Rory was also kept busy learning a new trick — the belly crawl! It’s important to give your dog new things to learn as it challenges them, provides them with a sense of doggy accomplishment and gives them with a beneficial mental workout. 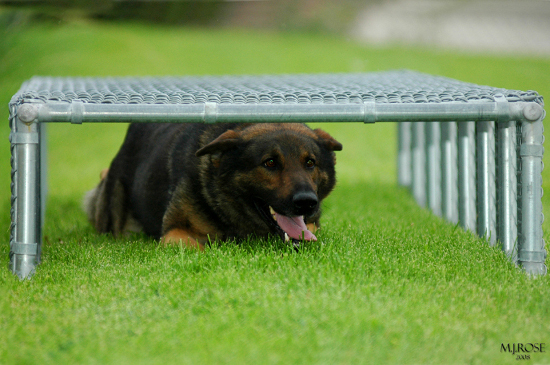 The belly crawl is far more than a party trick, often taught to police dogs to help them in tight situations. Rory, of course, is no police dog and her crawls are simply for fun and games. But how do you teach a canine who is used to walking on four legs to suddenly start shimmying along the ground? Here’s what we did. To begin with Rory had a nice long run to exhaust some of her plentiful energy and make her a little more receptive to the training process. She was then asked to lie down, a trick that she mastered ages ago. A treat was placed approximately two feet away from Rory on the floor and the words ‘Rory — Crawl — Yes’ were repeated slowly to her. It is important to use your pet’s name when training them so that they know the new command is directed towards them. We added the word ‘yes’ to let Rory know that she was allowed to have the treat, as she has been taught to wait before taking. Keeping a hand on Rory’s back to encourage the crawling action, Rory was then moved towards the treat and rewarded with it and enthusiastic congratulations. While she moved towards the treat the word, “Crawl” was spoken to her so that the action became associated with the term. The process was then repeated about a dozen times and then not readdressed until the following day. When we attempted the ‘crawl’ again Rory’s clever poodle mind remembered the action and only needed correcting a couple of times, scuttling along the floor in little pounce-like motions. By day three she was a smooth operator and crawled for her treat like a pro! Needless to say she is as pleased as punch with herself and now has a new skill added to her repertoire! Let us know if you teach your dog to crawl and let us know how they get on!